I supervise the weConnect classroom at George McDougall High School. My name is Chantelle Whetstone and I am the Learning Coordinator at George McDougall. The weConnect classroom provides a structured but flexible environment for students who wish to add an online learning component to their schedule. 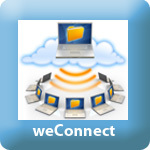 Here is the link to Rocky View Schools Community Learning Centre which describes the weConnect format and program.